Alex Beals | What's Line? 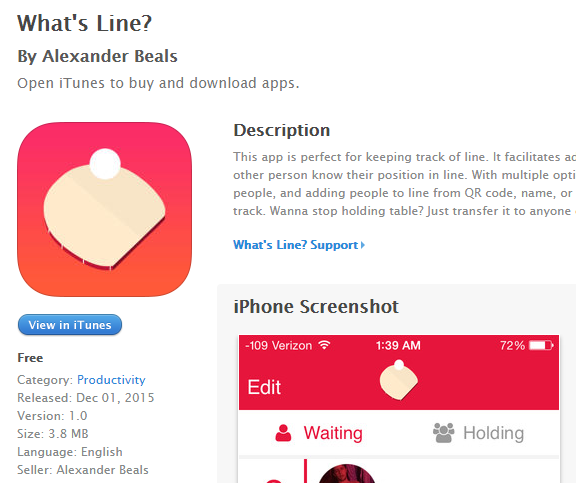 This app is perfect for keeping track of lines. It facilitates adding people, keeping track of who's next, and letting other people know their position in line. With multiple options including rearranging line, adding and removing people, and adding people to line from QR code, name, or telephone number, it makes it easier than ever to keep track. The app is built entirely using Swift, and interfaces with the MySQL backend using a custom PHP API. It was the first app that I've released for the App Store, and has succeeded in its niche application among Dartmouth students and establishments. By leveraging many of Apple's built in features, including QR code generation and scanning, it's never been easier to keep track of long lines. This application (perhaps with some slight polishing), could be perfect as a widespread system for seeing how long the wait is for restaurants without purchasing costly buzzer systems that may not have that great a range, and are cumbersome to keep track of. Feel free to install the app from iTunes.